Every day, I thank God for His calling on my life. In His service, I am often blessed to work with and on behalf of my brothers and sisters in the blindness community. 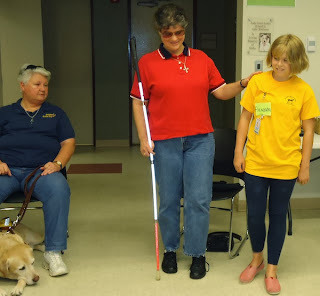 For the past several years, as part of this outreach, I have served as an officer of Dixie Land Guide Dog Users, Inc., and was recently honored to be elected Dixie Land’s Secretary/Treasurer for yet another term. I’m pictured here with my fellow newly-elected officers, Tweetie ford (First vice President), Brianna Murray (Second Vice President) and Audrey Gunter (President). 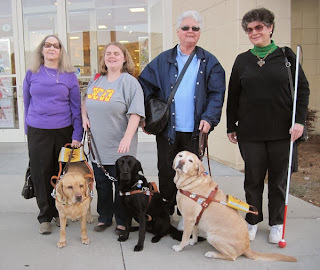 Dixie Land is the South Carolina affiliate of Guide Dog Users, Inc., among the world’s largest guide dog user groups. 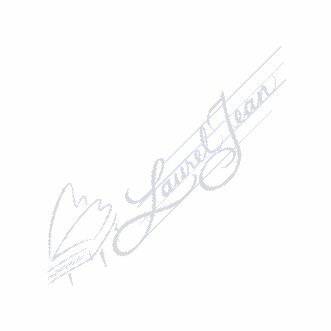 As many of my readers already know, I am an avid cane user and take great pride in continually honing my skills with the long, white cane. I also wholeheartedly support those who choose a guide dog as a means to their personal mobility and independence. I love guide dogs and am in awe of the incredible, indescribable bond that they share with their handlers. The guide teams pictured here with me are among my dearest friends. Tweetie with her guide Yvonne, is a native Charlestonian, a graduate of North Charleston High School, the University of South Carolina and the Medical University of South Carolina. In addition to her work in the medical field, Tweetie served actively as a church musician until health issues forced her to retire. She lost her sight later in life due to complications brought on by a stroke, and was matched with her first guide dog, Heidi in 2004. Heidi tragically passed away suddenly and Tweetie was matched with her second guide Yvonne in 2010. 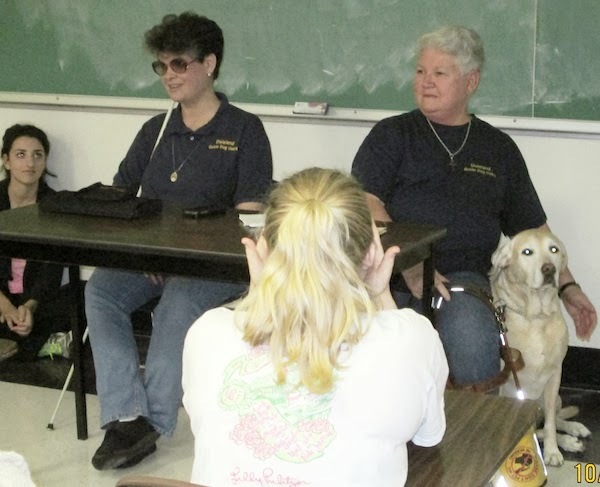 Tweetie and Horace, her husband of 42 years, served actively within the blindness community here in Charleston until Horace passed away in 2012. Also a devout Christian, Tweetie continues to serve her God and her community, and is a true friend of the musical ministry that God has given me. I knew Brianna, long before she was matched with her guide Lacy in 2011. She is one of the young people whom I was blessed to mentor as part of my youth chaplaincy. Like the rest of the young people with whom God has blessed my life, I find that she mentors me most of the time, especially when it comes to learning new computer and cell phone technology. As of this writing, Brianna is the only blind student to be accepted to the Charleston School of the Arts, where she graduated with honors as a violin major. She is currently a junior at Winthrop in Rock Hill, SC, pursuing a major in psychology and a minor in English. Since 2006, Audrey Gunter pictured with her current guide, Jessie, also continues to volunteer on behalf of my ministry. A native of Charleston, Audrey was diagnosed with Retinitis Pigmentosa and declared legally blind at age nineteen. She was told to get herself a cup and some pencils because she had nothing else to look forward to. Audrey received her ABA with honors in 1975. She retired in 2001 as the Director of the MUSC Department of Transportation. 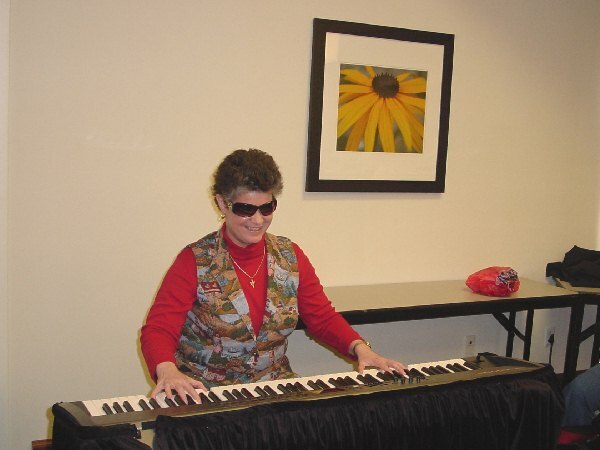 A pillar of the blindness community, Audrey is a Past President of both the Lowcountry Chapter and the State American Council of the Blind in South Carolina. She has served on the Board of Directors of the South Carolina Disability Resources Center, the Board of Directors of Guide Dog Users, Inc. and the Board Graduate Committee of Southeastern Guide Dog School (where she was matched with her first guide Zack and her current guide Jessie). Her book "Zack's Tales, Travels of a Guide Dog" can be purchased on my Web site. 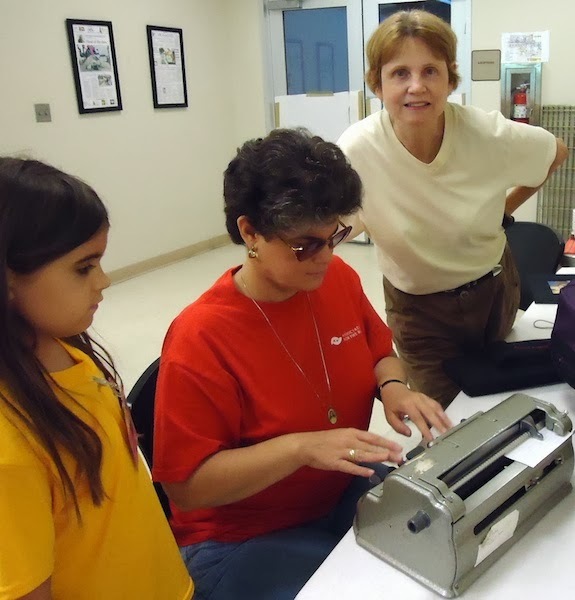 She founded the Southeast Regional Top Dog Workshop in 2006. In 2011, she was commissioned as a Stephen Minister at Grace United Methodist Church in Charleston, where she currently serves as an active member. Together and individually, my friends and I work to promote a positive image of the blindness community within the community at large. 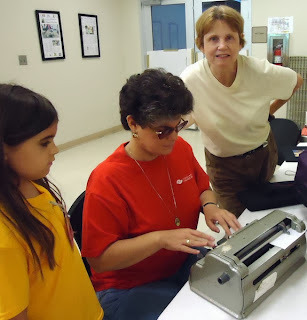 Our recent presentations have included Charleston’s ASPCA Bark Camp, where I am shown here brailing the names of day campers as our sighted friend Kevan-Ann Spangler, brings the photographer in focus. Here I am teaching day campers the proper way to serve as sighted guides. Recently, Audrey and I were also blessed to address the Delta Gamma Sorority of the College of Charleston, whose philanthropic focus serves the blindness community locally and beyond. My thanks to everyone whose prayers and support on behalf of my music and ministry help keep God’s Light shining. I’m just one of many members of the Body of Christ, called and able to serve our awesome, equal-opportunity God!